Swineapple - going for it. 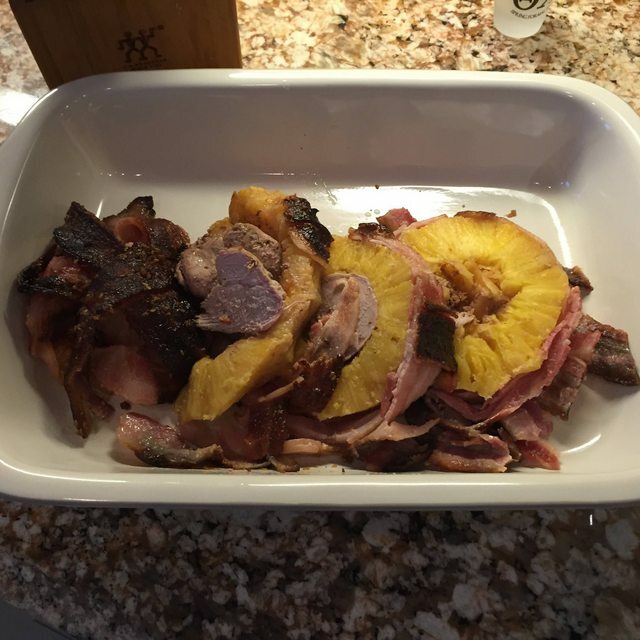 Pork goes into pineapple. Pineapple goes into Egg. 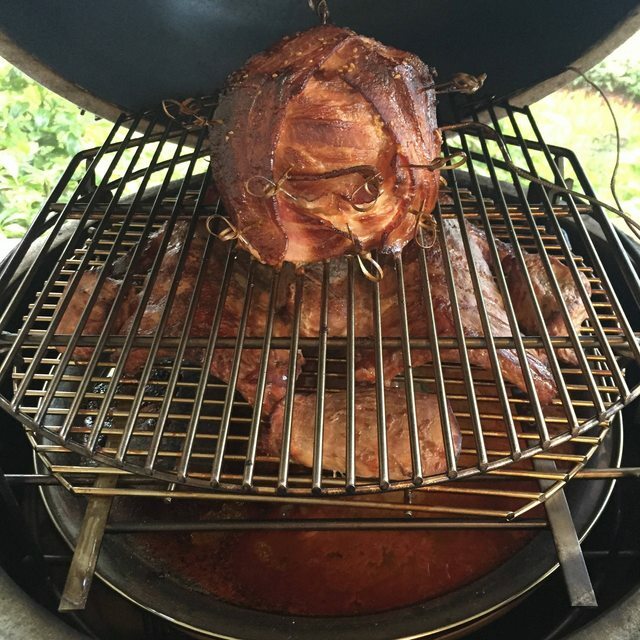 Smoke's in the Egg; our smoke. Bromelain is a meat tenderizer. Pineapples are chock full of bromelain. Bromelain is effective in small quantities and short exposure to make tough meat less tough. Bromelain, I would imagine, is effective in large quantities over a five-hour cook to make pork tenderloin into pork soup. 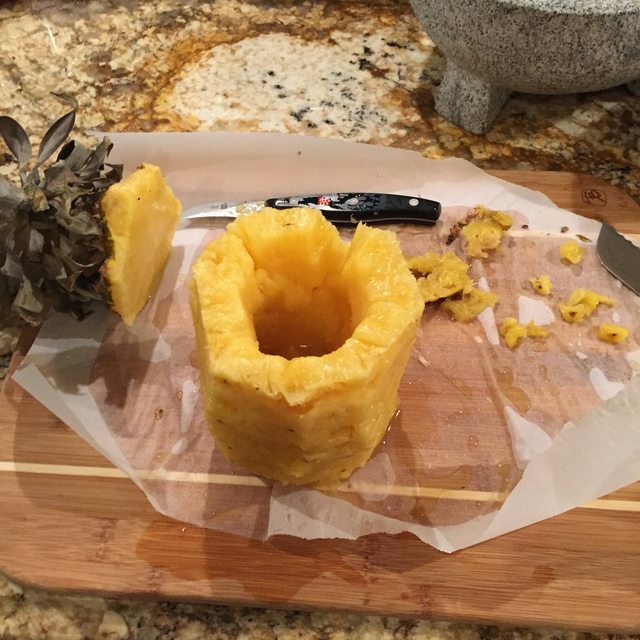 My goal, then, was to deactivate the bromelain enzyme before subjecting the already-plenty-tender tenderloins to unnecessary softening; i.e., before they go into the pineapple. 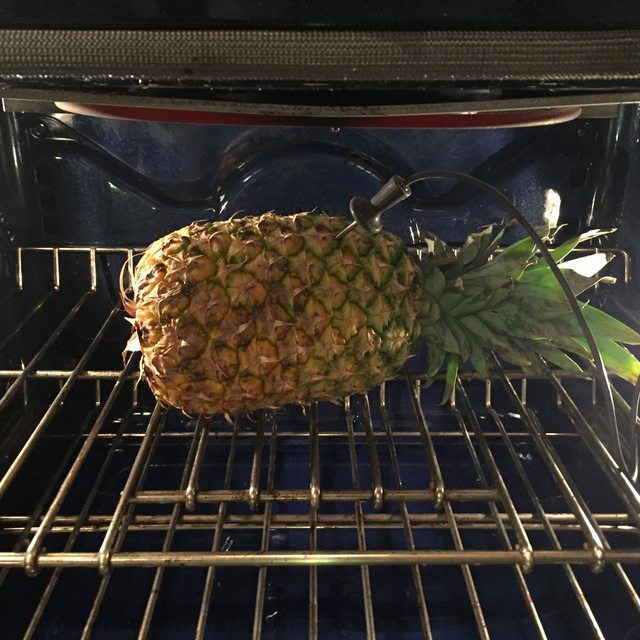 Wikipedia says that happens at 158 deg F. So last night, I threw the pineapple into the oven with a meat probe set to 165. I'd been imbibing some tasty beverages with a buddy of mine, and didn't want to wait around to see what happened next... so I left it in the oven overnight. Sure enough, at sometime before 4am today, the oven shut down and the pineapple was cooked. What I know now that I didn't know then was that a cooked pineapple is a lot like one of those wacky waving inflatable arm-flailing tubeman things you see at every single car dealership. It's pretty soft and jiggly. First issue. "First shalt thou take out the Holy Stem, then shalt thou insert three tenderloins, no more, no less. Three shall be the number thou shalt insert, and the number of the inserting shall be three. Four shalt thou not insert, neither insert thou two, excepting that thou then proceed to inserting three. Five is right out. Once the number three, being the third number, be inserted, then wrappeth thou thy holy swineapple of the Internet with bacon, who being hungry in My sight, shall smoke it and eat it." Before placing this on the top rack of my rig, I doused it with Trader Joe's Island Soyaki sauce, which is also what I'm using for the ribs. Alongside the ribs I've placed 4-5 more tenderloins and a couple of slices of bacon. If I'm neither too intoxicated nor too embarrassed to post photos of the results later, I will do so. 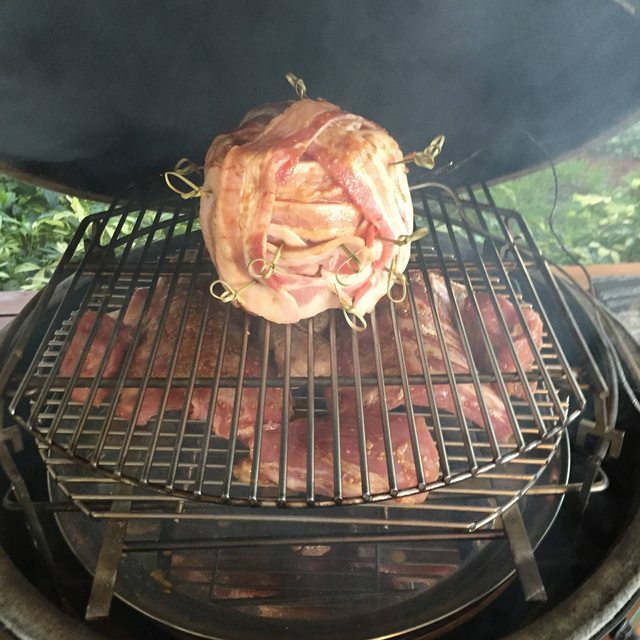 The ribs & swineapple went on a 7:35am, 225 deg F Egg temp, applewood chunks for smoke on BGE coal. I suspect that, later, I'll have something to say like, "I'm glad I made ribs too," or "How much do you want to bet I can punt this swineapple over my neighbor's fence?" I'll update after lunch. I'm watching this. Keep the updates coming. Omg this is great. And we'll told. Lots of beverages indeed. And maybe a trip to Colorado. Looks like it was conceived and executed some time after 420. And I mean that as a compliment! 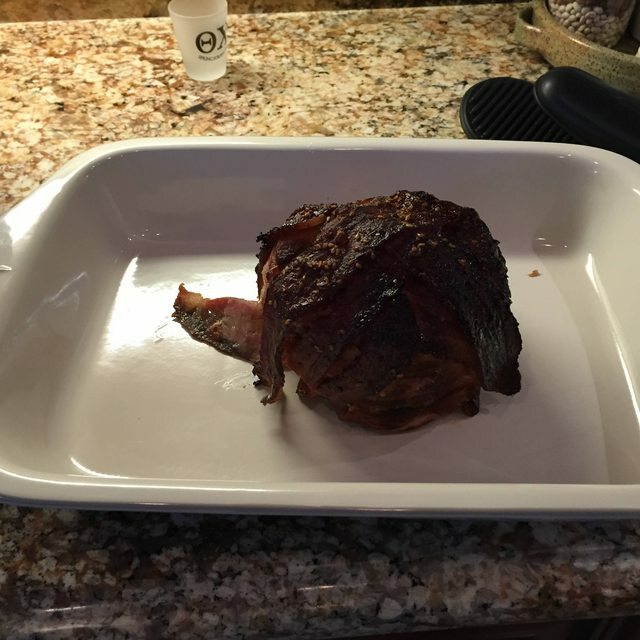 150 deg F internal temp after 2-1/2 hours! Granted, the swineapple is high in the dome, but so is my CyberQ pit probe. I'm dropping the Egg setpoint to 200 to ride it out until noon. There's no way the thing is going to dry out, anyway. In the meantime... 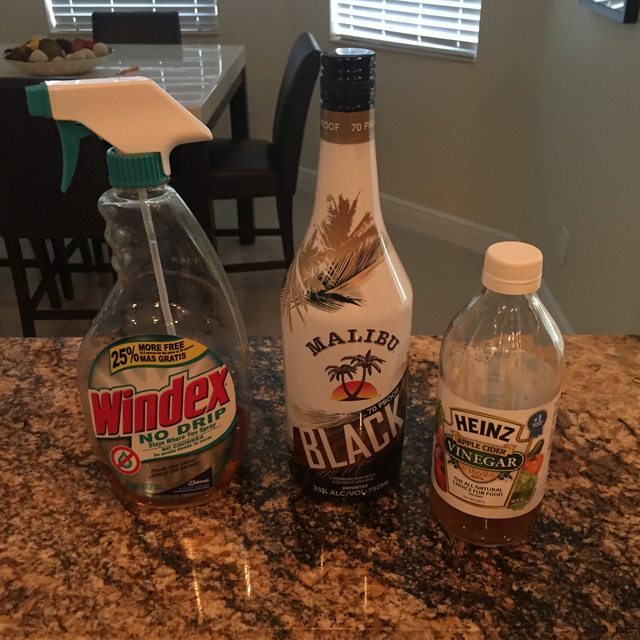 I'm spraying down the ribs with a proprietary mix of rum and cider vinegar. And probably at least a little Windex. OK, all done with lunch & drinks. 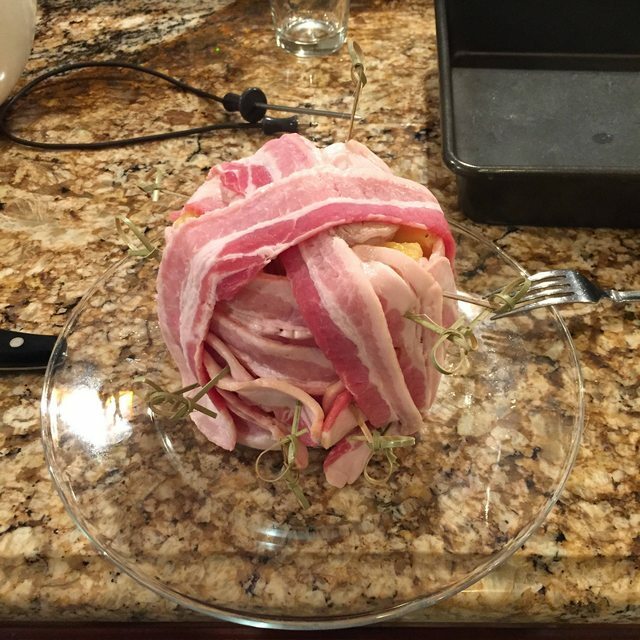 I think @Legume was the one that called the swineapple a "novelty cook." I couldn't agree more. Cooking the pineapple ahead of time did, I think, allow the pork to stay firm until I pulled it to eat. 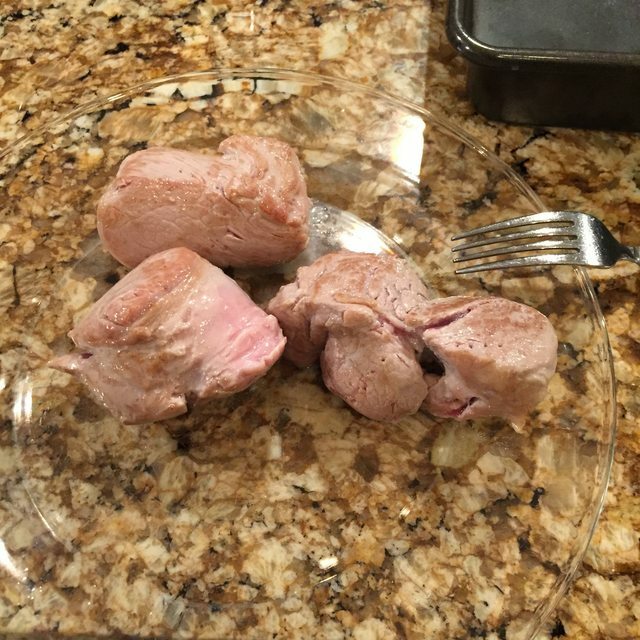 The taste wasn't any better than any of the other marinaded pork I made in the Egg alongside it, though. The pork tasted good, the pineapple tasted good... the bacon was excellent, but I think that was more due to the soyaki sauce than anything else. completely forgot I'd tried it once before. 5. Had a few drinks and was encouraged by my buddies. Nice cook. Thanks for posting.